This is a new and provocative study re-evaluating the history of the struggle between orthodoxy and heresy in the early church. Dr Williams argues that the traditional picture of Nicene ascendancy in the western church from 350 - 381 is substantially misleading, and in particular that the conventional portrait of Ambrose of Milan as one who rapidly and easily overpowered his &quot;Arian&quot; opponents is a fictional product derived from idealized accounts of the fifth century. 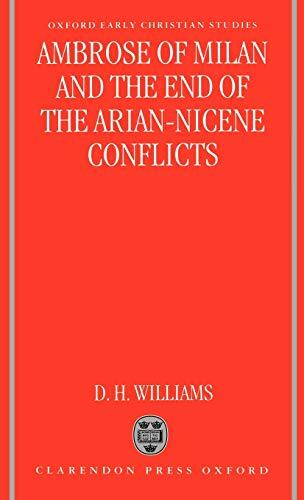 <br /><br />Sources illustrating the struggle between the orthodox pro-Nicenes and &quot;Arians&quot; or Homoians, in the fourth century reveal that Latin &quot;Arianism&quot; was not the lifeless and theologically alien system that historians of the last century would have us believe. Dr Williams shows that the majority of churches in the West had little practical use for the Nicene creed until the end of the 350s - over twenty five years after it was first issued under Constantine - and that the ultimate triumph of the Nicene faith was not as inevitable as it has been assumed. Ambrose himself was seriously harrassed by sustained attacks from &quot;Arians&quot; in Milan for the first decade of his episcopate, and his early career demonstrates the severity of the religious conflict which embroiled the western churches,especially in North Italy. Only after an intense and uncertain decade did Ambrose finally prevail in Milan once the Nicene form of faith was embraced by the Roman empire through imperial legislation and &quot;Arianism&quot; was outlawed as heresy. This is an innovative and challenging book full of illumination new insights on the social, political, and theological entanglements ofthe early church.